Let's face it. some of us don't like vegetables any more than our toddlers do.Most of us do not get enough servings of fruits,vegetables and whole grains that our bodies need. A single food can never provide all the essential nutrients that our body needs. Therefore it's always important to consume a wide variety of food to provide adequate intakes of vitamins,minerals and dietary fiber.Vegetables can be added to almost any food. 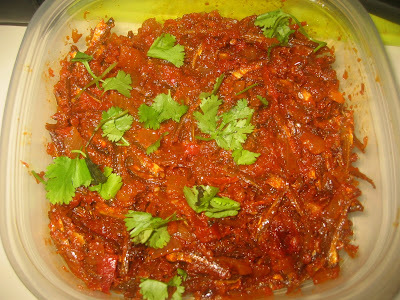 They generally add a lot of flavor to main dishes, as well as a lot of nutrition. I have a habit of adding vegetable to my meat dishes even fruits sometimes. They add more flavors and the dishes looks more tempting and colorful too. I have omit the addition of meat to my stir-fry this time. I wanted to tasty each vegetable by it's own flavor. Believe me it tasted awesome with fried rice. Heat the oil in wok. Add the garlic,onions and carrots-stir fry until the onions becomes soft.Then add celery,pepper,beans,baby corn,water chestnuts and broccoli.All the vegetables to get cooked till tender.Finally add the blended cornflour and the sauces. Stir until sauce boils and thickens slightly.Remove from flame and transfer to a serving plate. 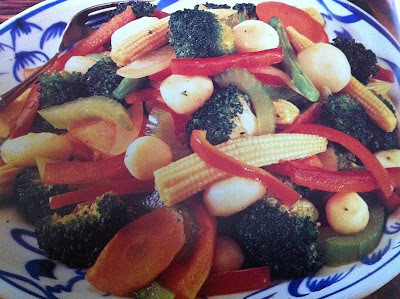 this is the way how i usual cook mixed veggie too, look so nice. A great way to eat veggies...Yumm! colorful veggies and very inviting! Very colourful stir fry, looks yumm! so yummy and so healthy too..
love these veggies.. looks yum! Never knew if we could include mixed veggies like this in our daily menu. Seems so healthy dear. How are you? Started Deepavali enjoyment? Happy Deeapavali dear. Nice and healthy dish. Looks delicious and yummy. I think making stir fry is one of the easiest dinners you can make now that they have frozen stir fry vegetable bagged in the grocery store. A little broth and seasonings and dinner is served.